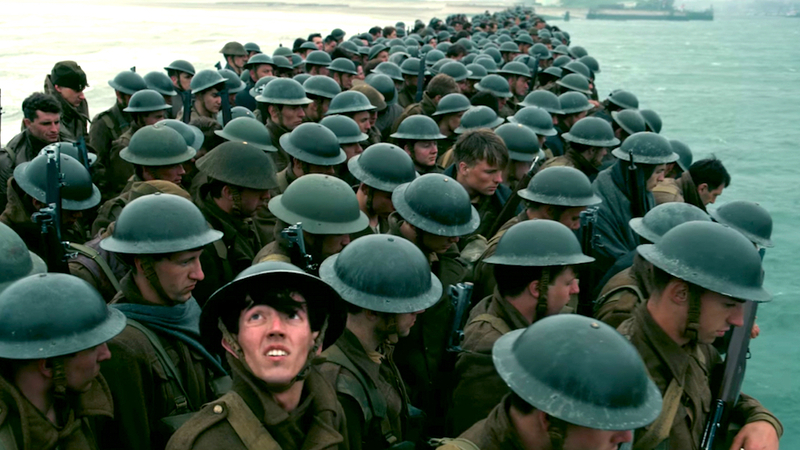 Dunkirk is part of My Summer of Summer Movies, in which I am attempting to see and review every movie that opens (in Chicago) between Memorial Day and Labor Day. Read all about this ill-advised plan here. When I wrote about Sergei Eisenstein’s Battleship Potemkin (1925) for my series Independent Study in World Cinema, I spent about 7,000 words discussing what made the film such a groundbreaking masterpiece. And then, right at the end, I allowed myself three paragraphs to admit that I would never really love it. It was not that Potemkin left me cold, exactly: Eisenstein’s unquestionable brilliance with camerawork and montage could and did achieve powerful, even visceral emotional effects in me. But, because Eisenstein didn’t really believe in characters—a good communist, he favored the notion of a “mass protagonist”—these reactions were curiously detached from anything I think of as narrative: the film provided a thrilling cinematic experience, but not an emotionally empathetic one. Eisenstein’s camerawork and editing deliberately thwarted the limitations of the individual eye, and his sparse script provided no “characters” to whom anyone could really relate. There was, in the end, no opportunity to connect to anything that was truly, authentically human. I am thinking about all of this today, obviously, because I had a reaction that was similar—though not precisely the same—to Christopher Nolan’s new film Dunkirk. There are superficial and facile comparisons to make between the two works—though it goes without saying that Potemkin is the greater achievement—but the real connection, in my mind, is that each film forced me to ask myself the same question: Can a movie be great if I don’t really care about the people in it? Dunkirk is the story of how—in the words of Winston Churchill—a “colossal military disaster” was turned into “a miracle of deliverance, achieved by valor, by perseverance, by perfect discipline, by faultless service, by resource, by skill, by unconquerable fidelity.” In May of 1940, after being cut off by German forces, some 400,000 Allied troops—including the bulk of the British Expeditionary Force—found themselves stranded on the beaches of Dunkirk, in the North of France. They could almost see home—just 20 miles across the Strait of Dover—but there was no reasonable expectation of rescue. In fact, as Churchill admitted, he fully expected to use his scheduled speech at the House of Commons on June 4 to announce that 90 percent of the British Army had been lost. 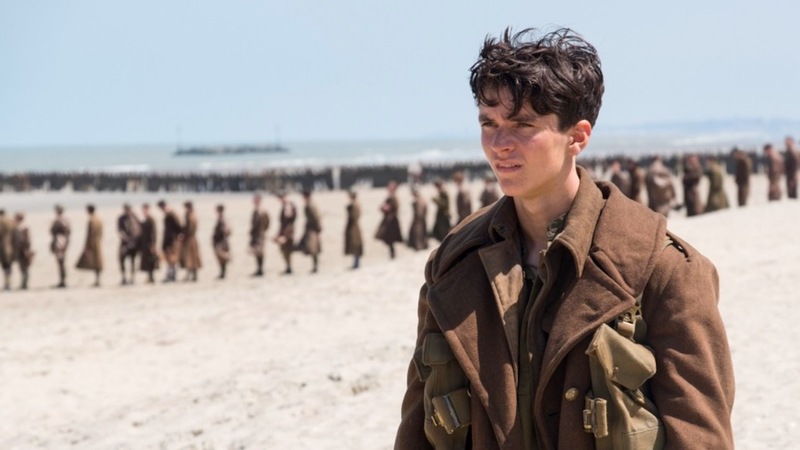 In “The Mole”—named for the Dunkirk Harbor breakwater used as a makeshift bridge to evacuate troops to the larger ships—Nolan focuses on the plight of the soldiers on the beach over the course of a week, seen largely through the eyes of a young British soldier (Fionn Whitehead). In “The Sea,” which takes place over the course of a day, we follow one of the civilian vessels assisting in the evacuation, crewed by Mr. Dawson (Mark Rylance), his son Peter (Tom-Glynn-Carney), and Peter’s young friend George (Barry Keoghan). Finally, in “The Air,” which takes place over a single hour, we go into battle with two British Spitfire pilots (Tom Hardy and Jack Lowden) trying to protect the men and the boats from the bombing and strafing raids of the Luftwaffe. Dunkirk is not, in fact, really a war movie at all, except in the larger sense of providing some taste of the experience of war. It plays out like more of a disaster movie: the dominant feeling—appropriately enough—is of being trapped, and the only military objective is survival. (“All we did was survive,” one of the soldiers says, at the end of the film, after being congratulated by an old man. “That’s enough,” the old man assures him.) Throughout the course of the film Nolan stages one powerfully tense scene after another of men moving from frying pan to fire. We are on the beach, with nowhere to run, as the German bombs land closer and closer to our foregrounded position in the frame. We are on the breakwater, packed shoulder-to-shoulder, when parts of it begin exploding. We are inside a crowded rescue ship, full of men who thought they were saved, when it takes a torpedo in the side. We are inside a sinking airplane, filling with water, watching the pilot try in vain to get its canopy open. In one fantastically nerve-wracking scene, we have joined a few straggling men taking shelter inside a beached boat, when Germans—completely unseen from our vantage point—begin using it, randomly, for target practice: bullets punch sudden sunlight through the hull and ricochet, with deafening and deadly terror, around the claustrophobic interior. Each of these segments is a small masterpiece of craftsmanship, suspenseful, intimate, and visceral. And yet—and you knew, when I began, that there would be an “and yet”—it is, paradoxically and frustratingly, an impersonal sort of intimacy. Whitehead’s young soldier, who is our visual anchor-point through the chaos of “The Mole,” is listed as “Tommy” in the credits, but he is never named in the film, and he scarcely has a line of dialogue: his performance is excellent, but he is (intentionally) an audience-surrogate, not a character. The pilots of “The Air” are heroic—and their dogfights feature some of Nolan’s best work—but they are anonymous: we might recognize Tom Hardy’s eyes, but he is nameless, featureless, and—behind his oxygen mask—every bit as unintelligible as every other Tom Hardy character. (Dunkirk, in general, has very little dialogue, and very little of that is audible in any decipherable way.) Only in “The Sea” does Nolan approach relatable characters—largely through the infallibly brilliant Mark Rylance, who just embodies thoughtful decency—and something of a more traditional narrative. (This section feels like a slightly different movie, a small play centering around an unstable, shell-shocked sailor [Cillian Murphy] picked up from a sinking submarine, and an emergency that develops around the good-natured George.) Nolan is interested in moments of crisis, moments of cowardice and heroism, but he is not interested in characters, let alone in character-development. I hasten to repeat: this is all intentional, and I have no doubt that many viewers will say these qualities are exactly what recommend Dunkirk as a masterpiece. I am—intellectually, at least—undecided on that point myself. I quite admire Nolan’s commitment to his Potemkin-like vision: the heroes of Dunkirk are not quite Eisenstein’s “mass protagonist”—there is a little more individuality than that—but it seems to me that Nolan’s intention is similar: to provide a holistic sensory experience of warfare, rather than any personal, linear narrative. I admire his eschewing of cheap sentimentality: he spares us the usual “pat-the-dog” scenes a lesser filmmaker would use to earn our affection for characters, leaves out all the speechifying, and mercifully shuns the sorts of soul-baring backstories that sometimes weaken an otherwise great film like Saving Private Ryan. And yet, for all its flaws, a film like Saving Private Ryan moves me, in a way that Dunkirk did not. I was reminded watching Dunkirk that I have never really cared about a single character in any Christopher Nolan film, and that this is why I think of him as an intelligent and technically proficient filmmaker, but not a great one. In watching Dunkirk I was free to project myself onto Whitehead’s character—if I wanted to make the effort, and if I could manage, with difficulty, to pick him out from the faceless throng—but Nolan otherwise wasn’t going to help me care whether he lived or died. A late scene of a Spitfire gliding silently over the beach—after expending every drop of its fuel in battle—was decidedly beautiful, but I found I did not particularly care if the heroic pilot behind the hauntingly still propeller landed safely or crashed. Hans Zimmer’s score might be a lovely piece of music in its own right, but in its constant, deafening bombast it actually overwhelmed the action on the screen, and was thus forced to manufacture emotions it was otherwise drowning out. Nolan’s chaotic action sequences—presented through his characteristically frequent, sometimes incomprehensible cuts—might have effectively conveyed the feeling of being in the madness of war, but it often did so at the expense of the good visual storytelling that might have provided me with a stronger, deeper connection to what was happening on-screen. Dunkirk may be a masterful depiction of a historic moment of human triumph, but it is not—for me—an emotionally powerful tale of actual human beings. For this reason, though I admire it—and will see it again, for there is a lot to admire—I don’t think I’ll ever love it.